Rice is a major food for the world's population and serves as a model plant in cereal genome research. The Rice Information GateWay (RIGW) was constructed in 2016 upon the completion of the Oryza sativa ssp. indica cv. 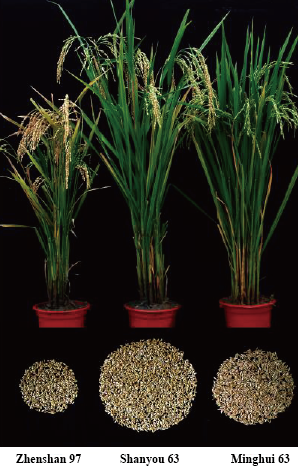 Zhenshan 97 and Minghui 63 genomes sequenced by Huazhong Agricultural University (HZAU) and Arizona Genomics Institute (AGI) with the aim of providing accurate and timely annotation of indica rice genome sequences. We have annotated the indica rice genomes ZS97 and MH63 for gene content, repetitive elements, non-coding RNA, SNPs, inversions, translocations, presence/absence variations, and segmental duplications, etc. Sequence polymorphisms between different rice subspecies indica and japonica have been identified. Designed as a basic platform for indica rice study, RIGW presents the sequenced genomes and related information in systematic and graphical ways for the convenience of in-depth comparative studies.